As the world’s youngest democracy and arguably the last truly authentic place, Bhutan’s unique culture bridges the traditions of a forgotten time with today’s changing world. 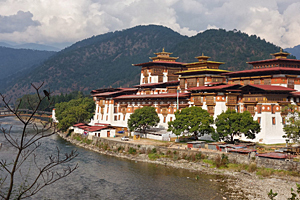 To guide their new democracy, Bhutan developed the guiding principle of Gross National Happiness (GNH) – measuring “happiness” as the highest attribute of all decision making. After traveling to Bhutan in December 2013, we knew this was a place EO members needed to experience. The journey begins looking out the window, as you soar over the Himalayas before quickly descending into the Paro Valley. Upon arrival, you will be greeted with a kindness that quickly settles you into the Bhutanese calmness and Buddhist mindset. Nothing moves quickly in Bhutan, so be prepared for rustic, slow and bumpy roads— which are all part of the journey. In this rapidly evolving country, entrepreneurship is driving the culture and economy forward. In a place with few industries, citizens are turning to entrepreneurship as a new path for success and leveraging the full support of the Bhutanese government. Through the 2014 EO Bhutan Global Exploration, EO members will have the opportunity to get a glimpse into this evolving entrepreneurial culture. There are a few rare journeys that we embark on during our lifetime. This is not a simple vacation; it’s more of a journey for personal growth – an opportunity to enrich one’s inner self through interaction with magnificent people and cultures. This program will bring together EO members and guests from around the globe to convene in a setting that encourages intellectual curiosity, camaraderie and entrepreneurial growth. We look forward to welcoming you to Bhutan!